Join us on Sunday April 7th at Tunes for Tails! 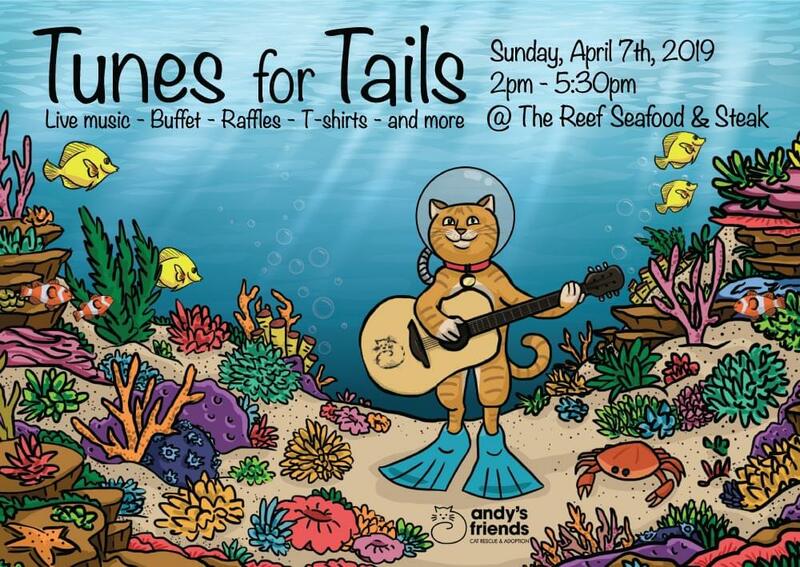 There will be live music by Sycamore Alley, a hot buffet*, and dozens of awesome raffles. *Hot Buffet requires a wrist band purchase of $25.00 per person either at the door, or through pre-registration below. Drinks and items off the regular menu are not included. Kids 8 and under eat free. Thank you for registering to receive a Tunes for Tails buffet wristband for $25.00 . You will receive a FREE premium raffle ticket ($5 value) when you check in at the door. Within 24 hours of your purchase, you should have received a confirmation from PayPal. You must bring a copy of this email with you, and a valid ID with the name on the registration form. *Note: Pre-registration donations are non-refundable. Buffet wristband does not include drinks, or regular menu items. You can enter this raffle using a special raffle ticket, purchased at the event. Here's a quick list of SOME of the items you could win in our raffles! A 58" Sharp 4K UHD Smart TV - equipped with Roku for fast, easy access to your favorite streaming apps! Baked Ziti, Meatballs, Sliced Roast Beef, Shrimp Macaroni Bake, Chicken Marsala, Parsley Potatoes, Green Bean Almondine, Caesar Salad, Rolls & Butter. If you prefer, you are welcome to take a look at the buffet when you arrive, before making the decision to purchase a wristband. If you don't see any options that work for you, that's okay! You can still hang out, buy raffles, and order off of the restaurant menu. The proceeds will not go to us from your food this way, but we'd rather have you with us than not! In addition, there are two $6 specialty drinks we are offering to help raise money. Each drink purchased, will give $1 back to Andy's Friends. ​Meowgarita – El Jimador Silver Tequila, triple sec, margarita mix. Tom Cat Collins – New Amsterdam Gin, Lemon Juice, simple syrup, topped with club soda. Do I need a wristband to attend? It would be fabulous if you did get one, as part of the proceeds benefit the rescue, BUT you are in no way required to have one to attend the event in general. You're only required to have one to access the hot buffet. Feel free to attend just for the raffles, music, and friends if you prefer! They will begin playing around 2pm, as the event begins. They'll play until about 5pm, after which we will announce raffle winners! Do I have to stay to win the raffles I entered? When does the buffet stop? The restaurant will stop refilling trays around 4:50pm. You're welcome to still grab food - the kitchen will just start clearing things as they empty after this time. Wilmington sounds pretty far from me. Do you have closer events? We know it sounds far - but it's really just about one to two minutes over the border! It's really only "Wilmington" in address alone. It's less than a mile from being Ogden/Boothwyn, PA, in actuality! But, if you're looking for somewhere further into PA, we also host an event in the fall at Duffer's Tavern on Route 352. Follow our Facebook page for more information as it gets closer.